The East West setting is bezel set, allowing light to flow in from all angles and it is sculpted in perfect proportion to the center stone. It features a beautifully thin, yet strong band to hold its shape with every day wear. Classic and modern in its design, this setting will sit flush with any wedding band. This ring looks exceptionally on point when stacked with other rings of similar thickness. 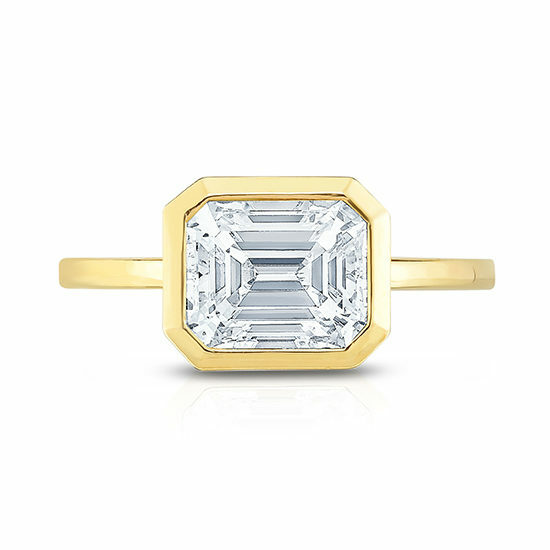 Shown here in 18K yellow gold with a 2.01 carat G color VVS2 clarity Emerald cut diamond. Available in all stone shapes from 0.75 carats. This setting is meticulously sculpted in either platinum, 18k yellow gold, or 18k rose gold. Made in NYC. Please contact us to schedule an appointment with a diamond specialist and explore the different options available to you. We look forward to creating your perfect ring.